Hand Shape Assessment 2.0: history & the hand types! The History + the resulting perspective: hand index & finger length combined! The assessment of hand shape represents the basis of the so-called 'chirognomy', which concerns the art of judging character by the shape and appearance of the hand. An overview of the major historical developments in this perspective makes it possible to recognize how the hand shape works of C.S. d'Arpentigny, C.G. Carus, C. Wolff, F. Gettings, T. Dukes & Y. Requena provide a understanding of how human hand shape tends to vary with a combination of two factors: the so-called 'hand index' and 'finger length'. Also, an impression is presented for how hand shape tends to vary in various populations, including Sumo wrestlers, supermodels + various 4 other well-defined medical populations that are usually featured with typical tendencies in the body morphology. NOTICE: The term 'hand type' is sometimes used as a synonym for 'hand shape'; however, in the scientific literature the term 'hand type' is usually used to refer to aspects of the hand which do not relate the biometric proportions of the full HAND FORM (which provides the basis inside this article for the concept 'hand shape'). The 1st picture below (click HERE for larger version) presents a detailed overview of how hand shape assessment has evolved in time: starting with Captain Casimir Stanislas d'Arpentigny's six classic hand shapes, progressing via the work of Carl Gustav Carus, Charlotte Wolff & Fred Gettings into the so-called 'elemental hand shapes'. The chart describes how hand shape can be recognized to represent a combined measure of the so-called 'hand index' and finger length. More details are described in the accessory text after the hand shape chart below. In 1839 Captain Casimir Stanislas d'Arpentigny described his 6 major chirognomical hand shapes + a 7th so-called 'mixed' hand shapes, which were supposed to represent six shapes of 'tendances de l'intelligence' in people; d'Arpentigny's 6 major hand shapes are: the elementary hand, spatulate hand, square hand, philosophic hand, conic hand & the psychic hand. D'Arpentigny's work was printed much later in 1895 under the title: 'La Chirognomonie Ou L'art De Reconnaitre Les Tendances De L'intelligence D'après Les Formes De La Main'. Meanwhile, in 1846 physiologist Carl Gustav Carus had described his 4 temperamental hand shapes (derived from d'Arpentigny's work) which were introduced inside his work titled 'Über Grund und Bedeutung der verschiedenen Formen der Hand in verschiedenen Personen'; Carus' hand shapes are: the elementary hand, motoric hand, sensitive hand & the psychic hand. Much later in 1943 psychologist Charlotte Wolff (who started her career as a physician) described her 6 endocrine hand shapes (derived from Carus' work) which were introduced inside her well-known book titled 'The Human Hand'; Wolff's hand shapes are: the elementary irregular hand, elementary simple hand, motoric fleshy hand, motoric bony hand, sensitive small hand & the sensitive long hand. Interestingly, only a year before Wolff had presented her book, Professor in physical anthropology Wilton Marion Krogman had introduced in 1942 the very first 'biometric' hand shape model. Krogman's 5 hand shapes are derived from the so-called 'hand index' (= defined as the ratio of hand breadth vs. hand length), which were described as: the hyperbrachycheir [extraordinary broad], brachycheir [broad], mesocheir [medium], dolichocheir [narrow] & hyperdolichocheir [extraordinary narrow]. Krogman introduced these hand shapes inside his article 'The Anthropology of the Hand'. Despite the fact that Krogman's hand model has hardly ever been notified in the traditional fields of chiromancy/chirology/chirognomy, the significance of this (biometric) work becomes obvious at the bottom of the picture above!!! Then in the 60's it was Fred Gettings who his alternative derived from the works of d'Arpentigny, Carus & Wolff. In 1965 he introduced his hand shape (form) model inside his 'The Book of the Hand: An illustrated history of Palmistry', which describes 4 hand shapes: the practical hand, intuitive hand, intellectual hand, and the sensitive hand. It is important to notify here that Gettings had already notified inside his 1965 work that there are at least two very different approaches available to describe the so-called 'elemental hand shapes'. According the traditional Eastern-approach e.g. described in detail by Yves Requena inside his 1982 work 'Character and Health: The Relationship of Acupuncture and Psychology' - the elemental hand shapes are being described in terms of: EARTH - WOOD - WATER - FIRE - METAL. However, in the Western-variant (which appears to have become more popular during the past few centuries) - e.g. described in detail by Terence Dukes inside his 1987 work 'Chinese Hand Analysis' - the elemental hand shapes are being described in terms of: EARTH - AIR - FIRE - WATER. Finally, one can recognize easily that in all seven hand shape models mentioned above the first hand shape meets the principle: 'SHORT, broad hand featured with SHORT fingers' and the last hand shape meets the principle: 'LONG, narrow hand featured with LONG fingers'. Also, sometimes the intermediate hand shapes clearly follow principles that sort of represent a combination of these first two extremities, which appear to represent typical manifestations inside the extremities of in respective Krogman's HYPERBRACHYCHEIR (inside the literature sometimes named 'hyperbrachycheri') and HYPERDOLICHOCHEIR (inside the literature sometimes named 'hyperdolichocheri'). In the accessory paragraphs a deeper understanding of the underlying principles will be presented. the 'Handbook of Normal Physical Measurements'! Researchers in the field of biometrics found that human hand, especially human palm, contains some characteristics that can be used for personal identification; however, this requires an assessment of e.g. the thickness of the palm area and width, thickness and length of the fingers. However, beyond the purpose of personal identification hand shape can be used to assess the general qualities of the hand. 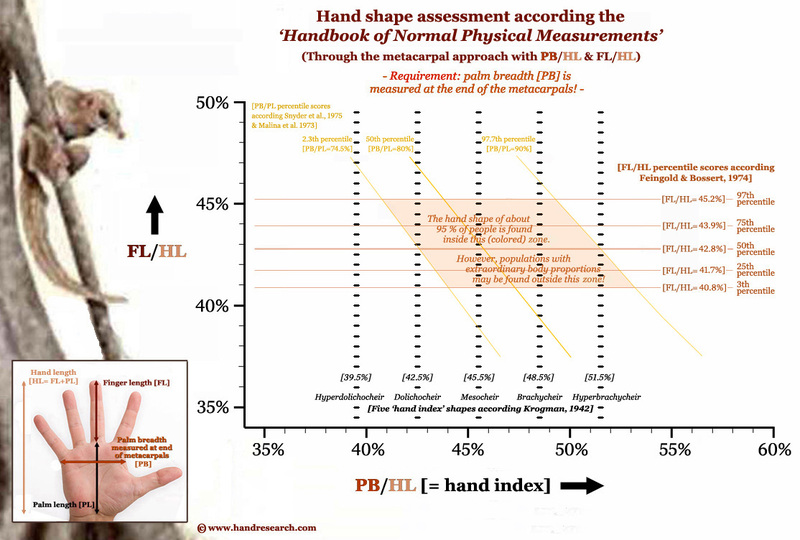 According the 'Handbook of Normal Physical Measurements' the assessment of hand shape basically only requires a measurement of finger length [FL], palm length [PL] & palm breadth (PB). The book also presents details regarding the variation of these hand dimensions, with references to the works of Feingold & Bossert (who presented in 1974 percentile scores for the normal American population), and the combined work of Snyder et al. (1975) & Malina et all (1973). 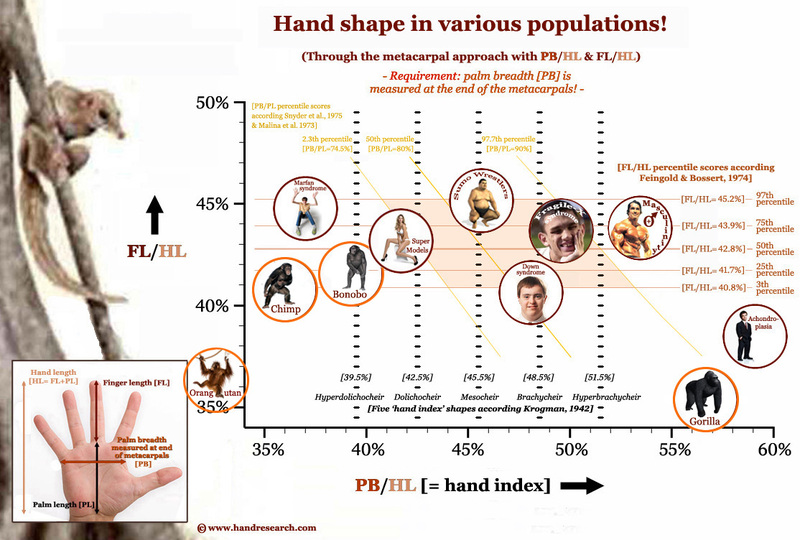 The reported percentile scores for the proportions PB/PL and FL/HL are presented inside the picture below, where HL represents hand length (= finger length + palm length). 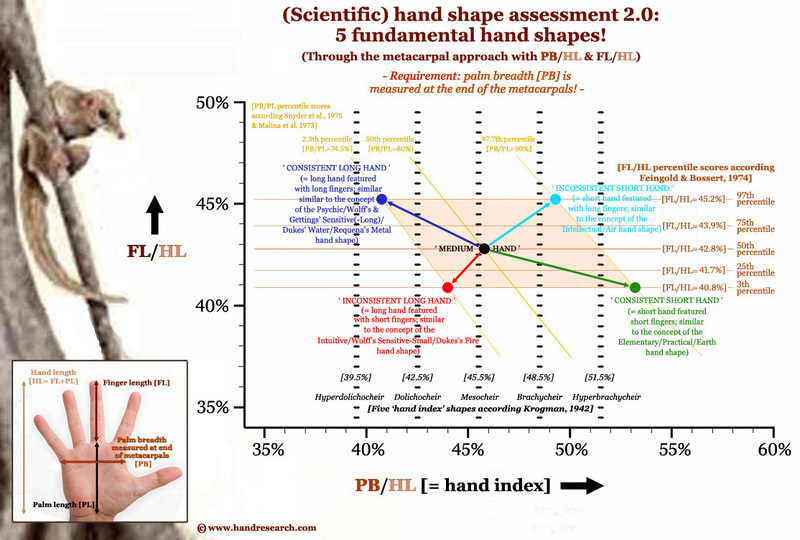 Interestingly, the 50th percentile scores for both proportions together are found very close to the average 'mesocheir' hand shape described by Krogman (1942) - which indicates that PB/HL=45.5% likely indeed represents the average/medium 'hand index' (read: overall hand shape). The percentile scores combined also indicate that about 95% of people can be expected to have a hand shape that is found in the colored zone inside the picture below. - SHORT finger length requires FL/HL < 42% (FL/PL<72%); extraordinary finger length requires FL/HL < 41% (FL/PL<69%). This implicates that the proportional formula for MEDIUM hand shape is: FL=7.5 x PB=8.0 x PL=10.0. NOTICE: International average proportion is only slightly above the indicative MEDIUM/AVERAGE 43%; this implicates these percentages are well below the values that had been suggested for decades in the fields of palmistry; so, one should be aware that those earlier estimates [e.g. medium FL/PL was often assumed to be close to 80%, which was about 5% too high] are typically far too high/off-scale! Hand shape in various populations! The significance of the materials presented above (including the guidelines for long/medium/short finger length) is also illustrated by the average hand shape found in various populations: see picture below. The picture e.g. includes brand new results for the typical hand shape proportions seen in Sumo wrestling champions, extraordinary masculine males & female supermodels. Earlier, results had already been presented for Down syndrome (e.g. extraordinary short finger length = brachydactyly, combined with short palms), Fragile-X syndrome, Marfan syndrome (e.g. extraordinary long, slender finger length = dolichodactyly/arachnodactyly, a.k.a. 'spider fingers') & achondroplasia (e.g. extraordinary short finger length = brachydactyly, combined with extraordinary short palms). The typical hand shape proportions for the four human ape species (bonobos, chimpanzees, orangutans & gorillas) are also featured; proportions for other primate species are presented inside the article: Hand shape gives a clue about genes, chromosomes & DNA! The picture also shows how hand shape typically tends to manifest according the full body proportions; the details are described after the picture below. Summary of correlations between hand proportions and full body proportions in sub-populations: The most obvious example concerns achondroplasia, which is typically featured with disproportionally short limbs + high body-mass index; in the hand these tendencies manifests through disproportionately short (stubby) fingers + extraordinary broad hands. Opposite tendencies (compared to achondroplasia) are seen in Marfan syndrome, where the typically long, slender body proportions are usually featured with long finger length, combined with (extraordinary) narrow hands. • In Down syndrome it is hardly surprising to see that the hand proportions show likewise tendencies as seen in achondroplasia, because disproportionally short limbs (and fingers) are also a typical feature in trisomy 21. • Fragile-X syndrome presents sort of a slightly 'inconsistent' combination of hand features: the rather short hand (brachycheir) appears featured with relatively long finger length according the FL/HL (and FL/PL) dimension(s); however, one should be aware here that according the FL/PB-dimension (not mentioned before inside this article) the finger length is actually clearly BELOW medium/average! • In Western supermodels it is not surprizing to see the narrow (hyper)dolichocheir hand shape, which is for sure in line with the Western concept of the idyllically slim female body. Interestingly, it appears that the FL/PL finger length dimension is only just above medium; however, according the FL/PB-dimension the supermodels' finger length can actually be recognized to be well ABOVE medium/average and overall finger length (index) can here be described to be close to 'long'. • Finally, the hand proportions seen in Sumo wrestlers appear to represent a confirmation for Charlotte Wolff's muscled stereotype of the 'motoric fleshy hand'. hand index & finger length combined! The preceding paragraphs have demonstrated how in time hand shapes has been recognized to vary according principles that relate to the combination of hand index (the ratio of palm breadth versus hand length) and finger length (the ratio of finger length versus palm length). First, the hand shape chart describing the historical developments displayed how the role of the first dimension (hand index) becomes obvious when the various hand shape models get ranked accordingly; and then the materials from the 'Handbook of Normal Physical Measurements' described how the second dimension (finger length) gets involved. The final chart below describes how these key-elements tend to vary according rather simple consistent- or inconsistent combinations of hand index & finger length variations, resulting in 4 different hand shape types featured with medium hand shape (which can be described to represent the average of the other four) in between. And the sharp observers among the readers of this article might recognize how each of these 5 hand shape types appear to have shifted only slightly to the right side from Krogman's 5 hand shapes - see the Krogman's categories just above the horizontal axis! Actually, the 5 hand shapes can also recognized to be positioned IN BETWEEN Krogman's categories, with the hand shapes that are featured with long(er) finger lengths are a little bit shifted to the left side from those IN BETWEEN locations!!! Read more about hand shape assessment in the article: Find your elemental hand shape in 4 steps! Inside the picture a description is given for each of the 4 major hand shapes (colored dots) in the perspective of the hand shape models mentioned in the hand shape chart; the 4 major hand shapes correlate perfectly with the principles described in the hand shape models described by Gettings & Dukes. This is how Krogman's 1942 'hand index' model combined with 'finger length' variation provides the basis for 'hand shape assessment 2.0'. • Male hand index in 26 nations.